The team bringing safer peanuts to the world (from left): Wayne Szafranski, A&T director of economic outreach; Barry Burks, vice chancellor for research; Louis Judge, director of technology transfer; Jianmei Yu, research scientist; Johnny Rodrigues, Alrgn Bio founder; and Ann Russell, Alrgn director of U.S. operations. The world’s first commercially available hypoallergenic peanuts have officially emerged from the laboratory. 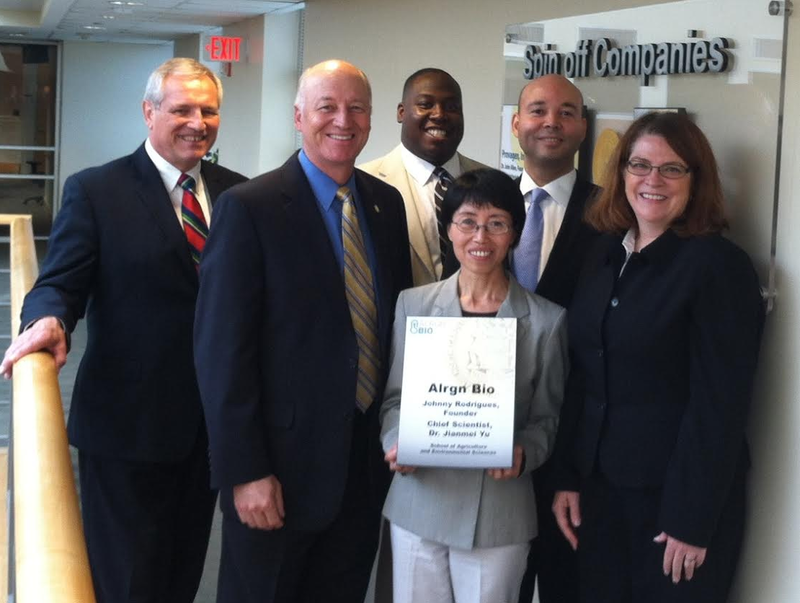 Alrgn Bio, exclusive licensee of the hypoallergenic process patented by North Carolina Agricultural and Technical State University, has opened an office in the Gateway University Research Park. Batches of peanuts are available to the food industry for evaluation, Alrgn announced today. “We have received tremendous interest since we announced in June that the technology is available,” said Johnny Rodrigues, Alrgn founder. Alrgn made the announcement Thursday at its demonstration facility at the Gateway University Research Park in Greensboro, North Carolina. Alrgn is a spin-off of N.C. A&T and Xemerge, the North Carolina- and Toronto-based technology development company that originally licensed the A&T peanut technology. Rodrigues introduced the new company to the news media and food industry executives along with two members of his executive team: Dr. Jianmei Yu, Alrgn’s chief scientist, leader of the research team that developed the technology, and research professor in the Department of Family and Consumer Sciences at A&T; and Ann Russell, Alrgn’s director of U.S. operations. “It is very gratifying to see the results of our research being brought to the marketplace for the benefit of individuals and families whose lives are affected by peanut allergies,” Dr. Yu said. The hypoallergenic peanut technology is one result of N.C. A&T’s strength in agriculture and particularly post-harvest technology. As a land-grant university, A&T has been a historic leader in agriculture research. Today, the university’s School of Agriculture and Environmental Science has expertise in biotechnology, agricultural and biosystems engineering, natural resources management, waste management, and food microbiology. It is the largest school of its kind at a historically black university. A&T’s agricultural research projects include Center for Excellence in Post-Harvest Technology at the North Carolina Research Campus in Kannapolis. The center adds value to agricultural commodities by finding ways to make food safer, to extend shelf life and to preserve health-promoting nutrients. Its research focuses on developing and testing functional foods, isolating and characterizing health-promoting food components, and improving processes to control spoilage and food-borne pathogens. This entry was posted in Agriculture, Biomedical Research, Biotechnology, Economic Development, Gateway University Research Park, Translational and Clinical Science and tagged Alrgn Bio, Ann Russell, Barry Burks, Dr. Jianmei Yu, hypoallergenic peanuts, Johnny Rodrigues, Louis Judge, Wayne Szafranski, Xemerge. Bookmark the permalink.